My husband is a teacher, a great teacher. He works well above 40 hours a week during the school year, and is dedicated to helping his students expand their minds and experience beauty through music. The school year can get LOOONG for our little family, and so when summer comes we are ready to PAR-TAY! We have the best couple months soaking up our family time, but when mid-August rolls around we are ready to get back to the routine of school, and husband is excited to start another year. These burgers are our traditional “Back-to-School” meal. They are really easy to make, but I only make them this one time during the year…because I’m pretty sure they could kill ya. They are THAT good. You can use any burger recipe you like to do this. Use your favorite flavor combos, seasonings, sauces etc. The important part is the stuffing mix, and the pickles, you need pickles. 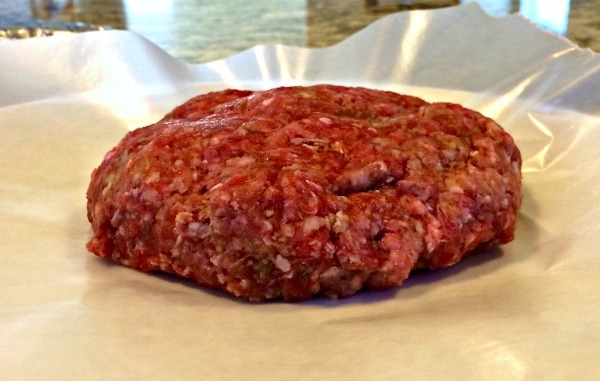 I will give you my basic burger recipe, but don’t be shy about using your own. 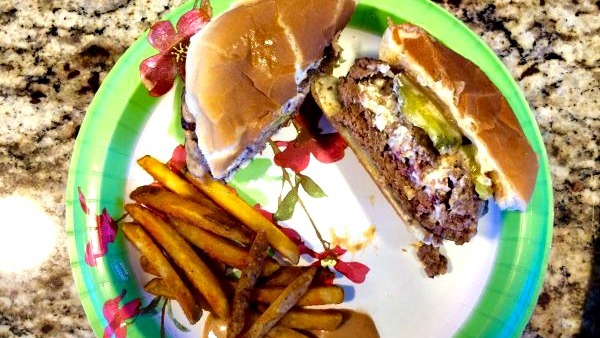 Because these burgers are stuffed you need a little more meat to make a full burger patty. I usually use a pound and half of ground beef, and can get 5 stuffed burgers out of that, give or take, depending on how big you make them. 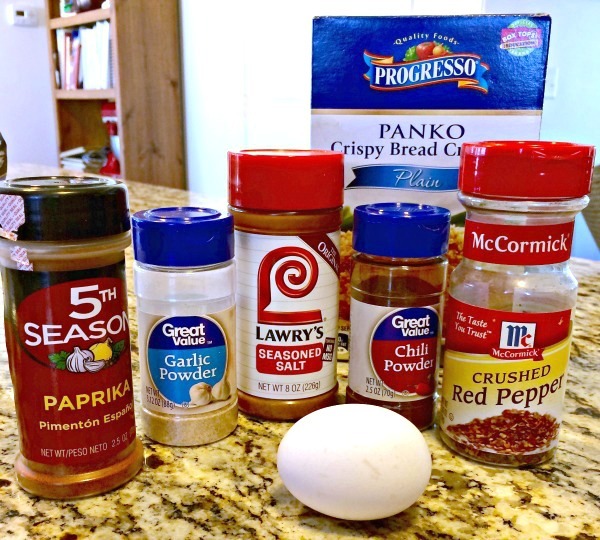 Start by mixing your ground beef with your seasonings, worcestershire, egg, and panko bread crumbs. Here are a few seasonings I like to use when I make burgers. You can use some of them, or all of them, or none of them. Life is good with options. 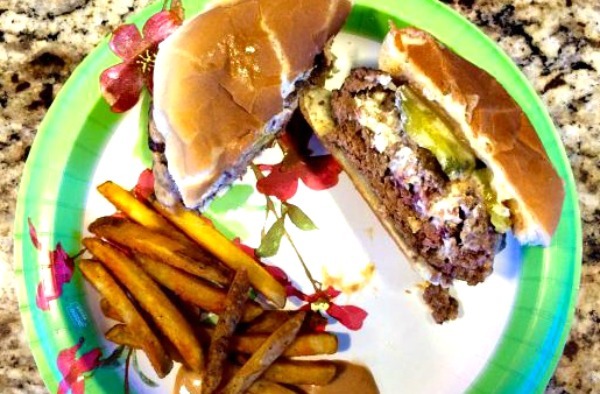 I like a flavorful burger, but again, the star of this show is the filling, so this recipe is designed to highlight our diva. Mix all your burger stuff together, well. I like to let my meat concoction rest, covered, in the fridge for at least an hour, BUT don’t worry about that step if you’re on a time crunch. Now prepare the “stuffed” element to this dish. Half a block cream cheese, a 2.5 ounce package of real bacon pieces (or cook your own bacon if you’re going all out), and 1/4 cup (or more if you like it strong) of blue cheese crumbles. 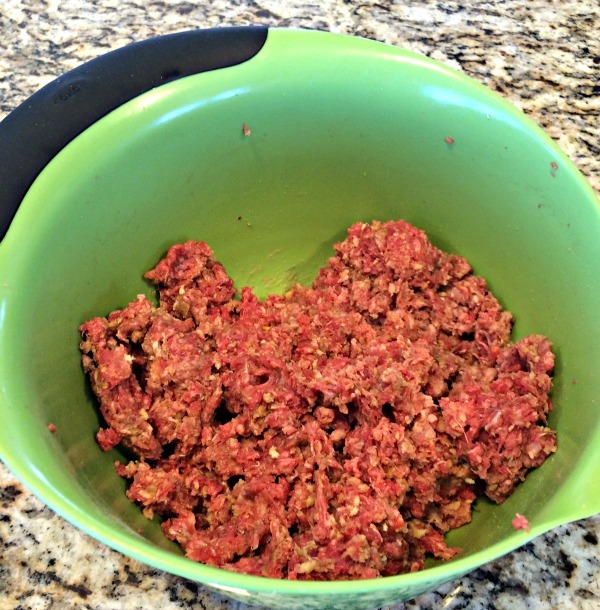 Take your meat mixture and form patties. I put down a sheet or two of wax paper and use that to help me. You need two thin, yet sturdy, patties to make a complete burger. This is about what mine look like, the are fairly big circles, but not too thick. Now lay the partner patty on top, pinch and smooth the edges. Take the extra minute to do this well, then you won’t lose any of that delicious filling in the cooking process. Pinch, and smooth and seal until you can’t see any sign of a seam around your burger. I made this picture nice and close-up so you can see how seamless these babies are. 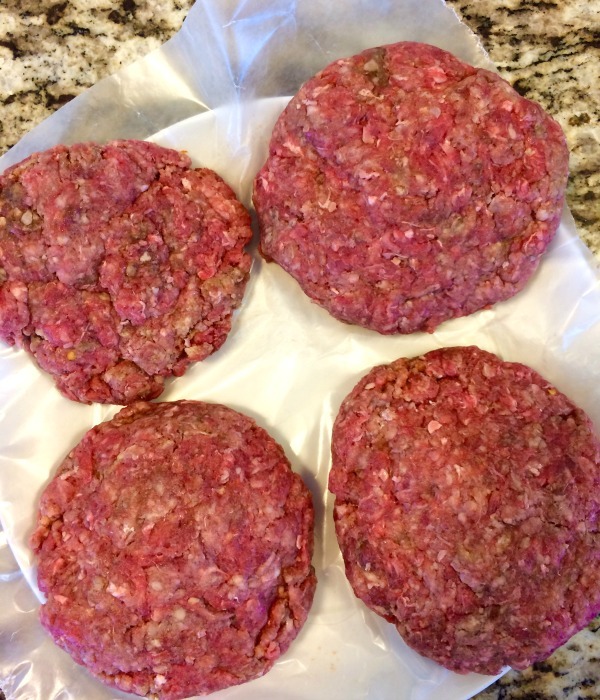 Here are 4 of my 5 burgers, ready to go. These are yummy on the grill, OR you can broil them, which is what I did this time. Not everyone is familiar with how to broil a burger in the oven, so here we go. Preheat your broiler, my broiler’s automatic setting is 525 degrees, which is the highest setting. I use that! Line 2, yes 2, cookie sheets, with tin foil. Spray with a little cooking spray, for good measure, and put those burgers on. Now, my secret, which DOES NOT have to be yours if it’s too crazy for you. I spread a little butter over the top of each patty, it soaks in during the broiling process, and, well, yeah…is magic. Pop these suckers into your hot oven. Time them for 5-7 minutes on the first side. There will be lots of juices, and some popping grease (transferring to the second cookie sheet, will help any smoking in your oven, from the grease). When the burger looks good and juicy remove the pan from the oven and flip your burgers onto the 2nd cookie sheet. If you’ve lined your baking sheets well, you don’t have greasy cleanup at all. Pop them back in the oven on that second side for another 5-7 minutes, depending on how done you like your burger. Remove, and let rest for 3-5 minutes on the cookie sheet. I love to serve these with a good quality bun, toasted, spread with a little mayo BBQ sauce combo and PICKLES. 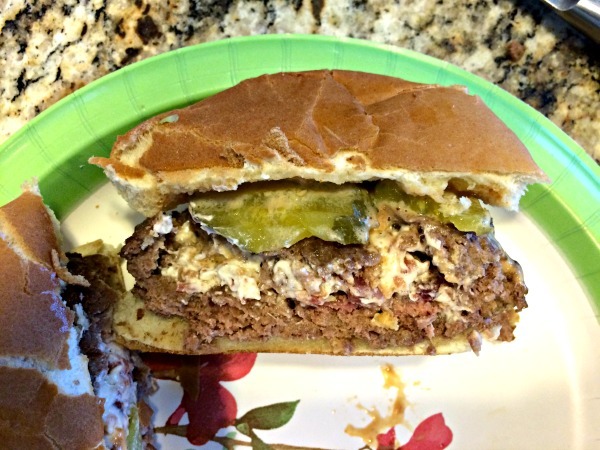 The acidity of pickles cuts through the richness of these burgers beautifully. Happy Back-to-School and Happy Burger Eating! In a medium bowl, mix all your burger patty ingredients together. 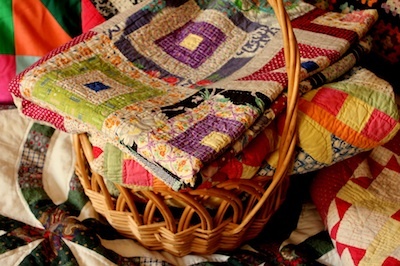 Don't be afraid to use your hands to be sure everything is incorporated. If you have time, cover your mixture and let it rest for an hour in the refrigerator. 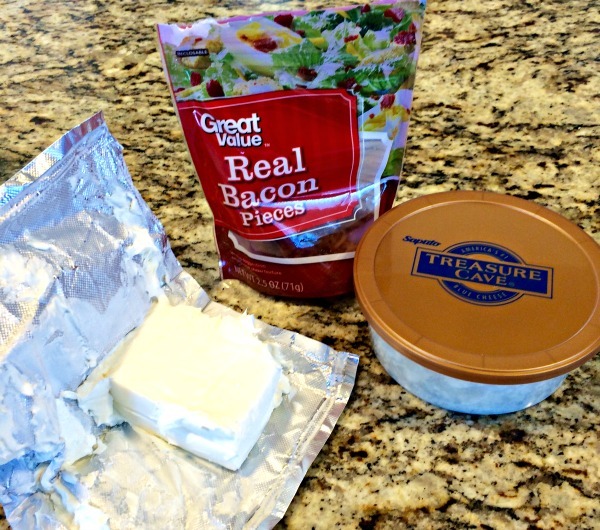 Make your filling by mixing your soft cream cheese, bacon pieces and blue cheese together. Form the burger mixture into thin, but sturdy, patty pairs. Spread 3-4 Tbs. of filling (or as much as will comfortably fit) onto one of your patties. Top this with the partner patty and pinch, smooth and seal the edges WELL. Grill these carefully on your girll, OR Preheat your oven's broiler to high and thoroughly line 2 cookie sheets with foil. 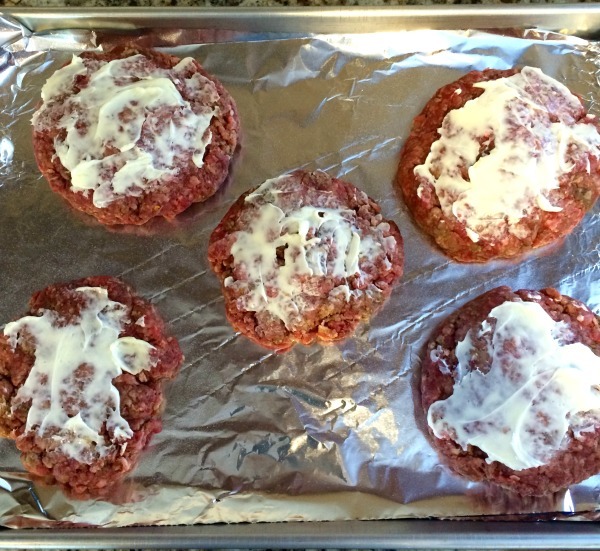 Spray the first cookie sheet lightly with cooking spray and put your burgers on. Spread a thin layer of butter over each burger. Broil these for 5-7 minutes, then remove them from the oven and flip them to the other side while transferring them to the second foil lined cookie sheet. Place them back into the oven for another 5-7 minutes, depending on how done you want them. Remove burgers from the oven and let rest 3-5 minutes. Serve on a toasted bun, with mayo, BBQ sauce, and pickles. These really do look amazing! It’s funny, I don’t really like blue cheese by itself, but I LOVE it *in* things. (My mom makes these amazing blue cheese potatoes!) I’m trying this soon!